The European theatre of WWII has been used as a staging device for so many forms of modern entertainment media that it’s hard to believe David Mack could find anything new or interesting to write about it in The Midnight Front (2018). And yet, he managed to come up with an angle I’ve never seen, implement it in a thoroughly researched and imaginative way, and open the door for subsequent books to examine the aftershocks of WWII throughout subsequent decades. I’ll be the first to admit that I’m impressed. Oxford University-educated Cade Martin is set to leave London and head back to America with his parents, despite some mysterious warnings from a man who accosts them just before boarding their ship. Just a few days later, their ship is sunk by torpedoes from a German submarine while a giant-tentacled leviathan plucks his parents from the sea and kills them, narrowly missing Cade. Luckily, he’s saved and spirited away to a castle in northern Scotland, where the man who tried to warn the Martins reveals himself to be Adair Macrae, who happens to be in charge of The Midnight Front, a top-secret program dedicated to summoning and yoking demons from Hell in order to fight the Nazis, who have their own sorcerers. 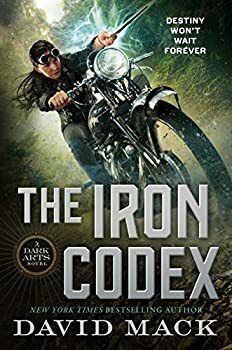 Given only three months to train alongside people who have been training for decades, Cade must learn everything he can about magick, subterfuge, and combat if they are to help turn the tide of the war. The cast of characters is nicely diverse, representing the many groups of people who would have aligned themselves either with or against the Nazis, depending on their backgrounds. The top sorcerers for either side, Adair Macrae and Kein Engle, are a little stereotypical and cookie-cutter, but their subordinates — particularly Cade and his counterpart under Engle, Briet Segfrunsdóttir — are written with far more depth, especially as Cade’s struggle to master himself and Briet’s personal motivations are gradually made clear. Adair has three other apprentices: Stefan Van Ausdall, Nikostratos Le Beau, and Anja Kernova, each of whom has their own magickal specialty and troubled background, and each of whom gets moments to make an impact on the reader. Engle’s only other subordinate is Siegmar Tuomainen, who operates the Thule Society, an occult-obsessed organization which really did exist and helped to put the Nazis in power. (Readers might recognize the name from Mike Mignola’s HELLBOY comics, or many of Charles Stross’ books.) In Mack’s fictional universe, the Thule Society is concerned with gathering demonic forces in order to protect high-ranking Nazi officials, as well as assisting with Nazi efforts to overthrow the world. Mack’s verisimilitude doesn’t stop there; ranging from 1939 to late 1945, The Midnight Front covers many important milestones throughout that time period, touching on the German invasions of Poland, France, and the Soviet Union, and the various military campaigns against them. The French resistance (and Vichy compliance), Polish ghettos and death camps, and the prolonged siege at Stalingrad are also featured, and Mack doesn’t shy away from accurate portrayals of either the horrors of war or the bravery of those who stood against the Nazis. Most unusual is Mack’s frank acknowledgement that leaders like Franklin Roosevelt, Winston Churchill, and Joseph Stalin were willing to engage in any tactics necessary to win the war, including the firebombing of Dresden and the deployment of atomic weapons in Japan, or, in the book’s fictional universe, the appropriation of demonic powers. There are no infallible heroes here, no Chosen Ones — Mack populates The Midnight Front with flawed, damaged people, and even the “good guys” have to make difficult, no-win decisions with heavy prices to pay. The demonology and metaphysical aspects of the novel take some getting used to, especially with the wealth of terms, specific lingo, and the seemingly never-ending litany of demonic names and abilities. Thankfully, a glossary has been provided, and Mack peppers The Midnight Front with frequent reminders of which demon confers which specific power being used, so readers won’t have to spend too much time scratching their heads or flipping back and forth from the page they’re reading to the appendices at the end. The Midnight Front ends, in my opinion, just as things are getting really good: with the implementation of Operation Paperclip. (That’s not a spoiler; it’s how history unfolded.) Too many authors focus on WWII and not on in the aftermath, like how the American and Soviet governments raced to recruit Nazi scientists and engineers in an effort to gain an advantage over one another in the Cold War. I’m very excited to see where Mack takes the DARK ARTS series from here, especially with regard to how his spin on alternate history will incorporate sorcery and demonology into, for example, the Space Race. I strongly recommend The Midnight Front for history buffs and fans of propulsive, compelling prose. Published January 30, 2017. From New York Times bestselling author David Mack comes a visionary World War II-era adventure. 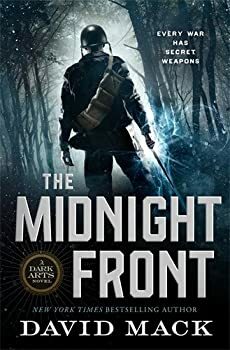 The Midnight Front is the epic first novel in the Dark Arts series. On the eve of World War Two, Nazi sorcerers come gunning for Cade but kill his family instead. His one path of vengeance is to become an apprentice of The Midnight Front―the Allies’ top-secret magickal warfare program―and become a sorcerer himself. Unsure who will kill him first―his allies, his enemies, or the demons he has to use to wield magick―Cade fights his way through occupied Europe and enemy lines. But he learns too late the true price of revenge will be more terrible than just the loss of his soul―and there’s no task harder than doing good with a power born of ultimate evil. I think my husband and I would both like this! I think you’d like it, too!